Looking for more great Dr. Seuss activities for your classroom? Check out our free curriculum guide for creative ideas and Dr. Seuss titles that fit across your curriculum. This holiday season, why not give the gift of literacy and reading? You can do just that when you enter our Give the Gift of Dr. Seuss giveaway! 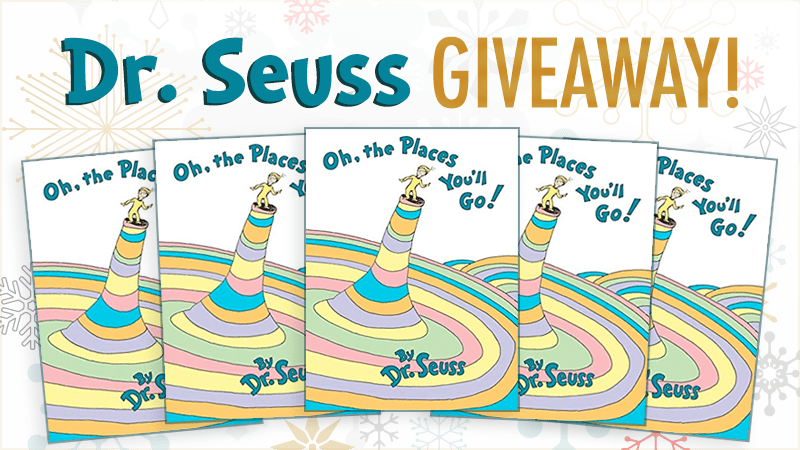 We’re awarding 10 lucky teachers a class set of Oh, the Places You’ll Go! That’s right—10 teachers will receive a copy of this beloved classic for every child in their class. Oh, the Places You’ll Go! is the perfect book for talking about setting goals and growth mindset, making it a great choice for your first read aloud of 2019! Click here for even more teaching ideas for Oh, the Places You’ll Go! And don’t forget to enter our giveaway for your chance to win! Yes! I Want My Class Set of Oh, the Places You’ll Go! No purchase necessary. Making a purchase will not increase your chances of winning. The promotion is open only to legal residents of the United States who at the time of entry are a) eighteen (18) years of age or older and b) currently employed full- or part-time as an educator by an accredited public or private K-12 school in the United States. WeAreTeachers is the official administrator of this program and Dr. Seuss Enterprises, L.P. is the Sponsor. Employees of WeAreTeachers or the Sponsor and their affiliated companies, subsidiaries, distributors, sales representatives, agents, advertising and promotional agencies, and the immediate families and household members (parent, spouse, child or sibling) of each are not eligible to participate. The Promotion is subject to all applicable federal, state, and local laws and regulations. All entries must be submitted using the online form by 11:59 p.m. Central Time on January 1, 2019. Winners will be selected by random drawing and announced on the WeAreTeachers website by January 4, 2019. Are You Ready for the Hour of Code™? Prepare With Our STEAM Giveaway!